Several federal and state laws protect American workers against different types of discrimination, including disability discrimination. The Federal Americans with Disabilities Act (ADA) and the California Fair Employment and Housing Act (FEHA) make it illegal for employers to discriminate on the basis of a disability. 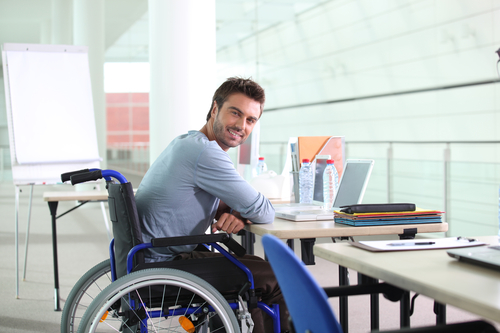 The plaintiff must prove that they have a disability: In California, an individual is considered disabled if they are limited in a major life activity. Under FEHA, work is always a major life activity. Therefore, the inability to perform at least one job due to a disability is sufficient to prove a limitation in a major life activity. The individual will be evaluated in an “unmitigated” state, that is, without consideration of the effect of things such as medication or prosthetic limbs. A plaintiff must be a “qualified individual”: A “qualified individual” is simply one who is able to do the job with or without reasonable accommodations. An employer must provide reasonable accommodations to a disabled employee which would allow them to perform the essential functions of their job. Such accommodations may include making the facilities readily accessible to disabled individuals, providing transfer or reassignment to a vacant position for which the disabled employee is qualified, providing modified work schedules, or providing modified equipment or devices to the disabled employee.However, the employer is not required to provide accommodations that would impose an “undue hardship” on them. For instance, an employer with less than ten employees is not required to install an elevator to enable her wheelchair-bound disabled employee to access her second story office, if there is no alternative access. That would be considered an undue hardship. However, the employer must still make other accommodations that are reasonable, which may include allowing the disabled employee to work from home. A plaintiff must have been unlawfully discriminated against because of his or her disability: The discrimination must be based on the individual’s disability. For instance, it is perfectly legal to refuse to hire an individual with no hands to be a typist – the individual might not be qualified for the job. Additionally, it is unlawful to discriminate against a person who is perceived to have a disability. If an employer mistakenly believes that the employee is disabled, and the employer discriminates against the employee based on that mistaken perception, the employer has acted illegally. Disability discrimination is very fact sensitive, such as whether a disabled employee’s requested accommodations were “reasonable” in light of the employer’s financial circumstances and other factors. Therefore, if you are disabled and want to ensure that your employer treats you fairly, or you feel like you have already been discriminated against, please contact our harassment & discrimination attorney at Rawa Law Group. Get An Experienced labor & employment attorney to find out your options.